Create a new file 800 x 600 @72dpi (to practice on). You can fill the background with any colour, I chose black. Create a new blank layer above the background layer and fill it with a ‘water’ colour, I chose R 0 – G 153 – B 153. You can now duplicate the new layer. Begin working on the top most layer. I have my foreground set to the colour mentioned above and the background to black. We are going to do a Render>Clouds – Hold down the Shift key just before you click on Clouds and it will give the effect more contrast. Now, hold down the Ctrl key and press the F key and it will give the clouds effect some variations – continue doing this till you get an effect you like. I did 6 hits on the F key to get the effect below. 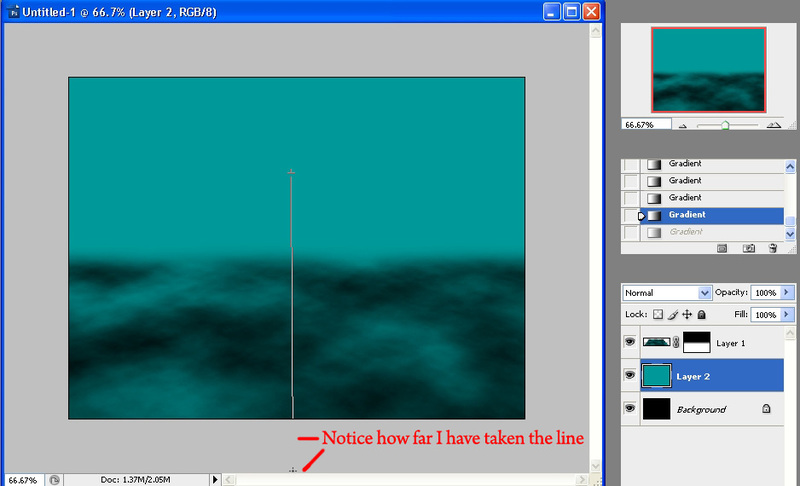 Still working on the clouds layer, bring up the Transform Tool by pressing Ctrl + T on the keyboard. 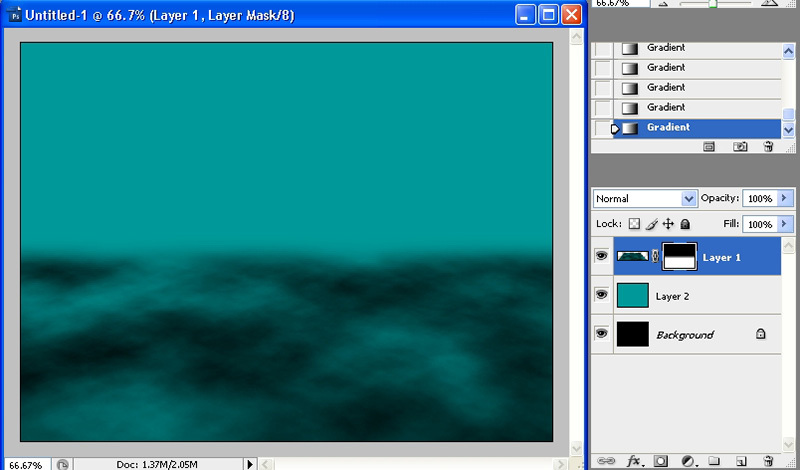 I have brought the top of the layer down to about halfway, you can do something different if you like. Once you have done that, right click inside the transform selection and choose Distort. You may want to pull back a bit on the image at this stage, because we are going to be doing some biggish distorting. See the image below for how I did mine. This is going to be the sea floor/bed. Add a layer mask to the sea floor layer by clicking on the little icon at the bottom of the layers palette. Make sure that your f/ground is set to black and the b/ground to white. 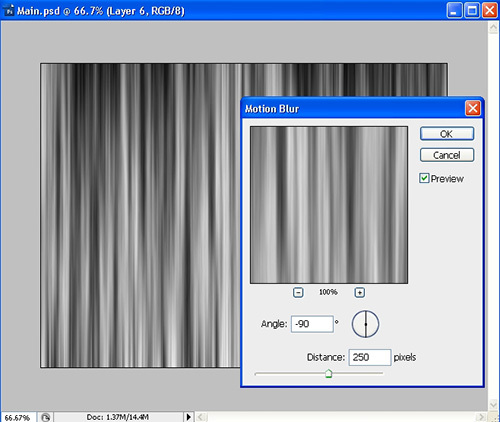 Select the gradient tool and make sure that the gradient is set to black to transparent. 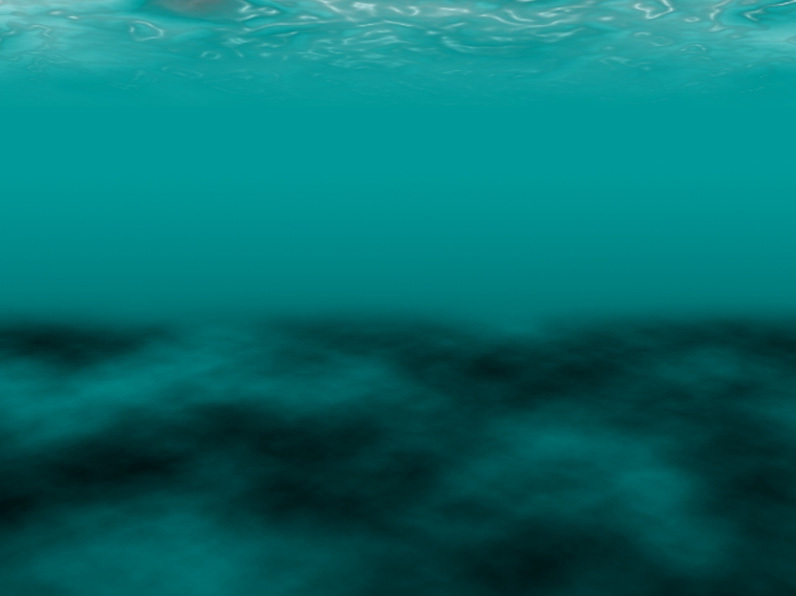 Click on the layer mask to make sure it is active and start your gradient above the sea floor, hold down your shift key to keep in straight and go about an equal distance down into the sea floor. You’ll kind of have to get this on your own – see the image below to get an idea of what you are trying to achieve. 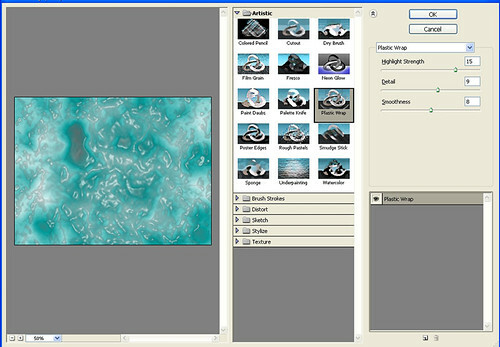 Make the other water layer active by clicking on it and choose the water colour again for the f/ground and black for the b/ground. Grab your gradient tool again and make sure that the f/ground and b/ground colours are the active colours for the gradient. You’re just going to a little bit of variation to the water. Starting about half way down the visible part of the water, hold down the shift key again and take the gradient past the image …. you’ll have to see the image below for a pointer. All we’ve done is add a little bit of depth to the water. Create a new layer at the top of your stack and fill it with the colour you chose for the water. 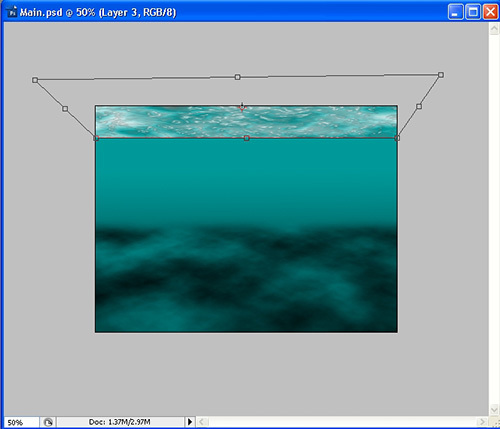 Next, make sure the f/ground is set to the water colour and the b/ground to white and we’re going to give this Render>Clouds like we did with the sea floor. Hold down the shift key if you want to get some extra contrast. Next go to Render>Difference Clouds and Ctrl + F until you end up with something similar to the image below. I clicked Ctrl + F once to get the effect. Still working on this layer, go to Filter>Artistic>Plastic Wrap and you can punch in the same numbers as I have (see image below). This is going to be the sheen for the top of the water. Go ahead and bring up the Transform Tool ( Ctrl + T ) and from the bottom, take the transform up to the top and then distort in the same way as you did the sea floor. See image below. 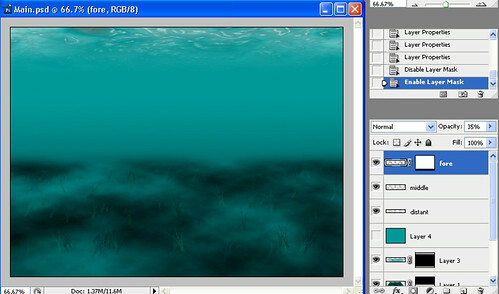 Add a layer mask and then do the same thing you did with the sea floor – seemingly fading the sheen into the background. 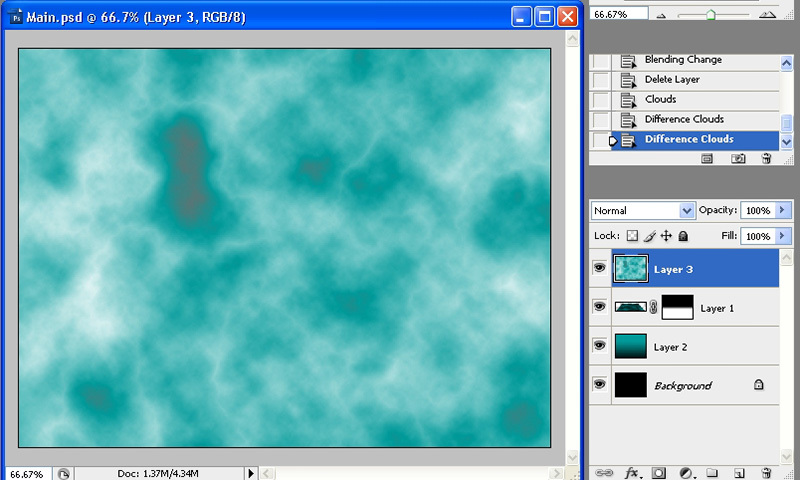 You could also reduce the opacity of this layer if you wanted to. You may end up with something similar to this. Next you can put in your fish, boat, treasure chest, old building, bridge, mermaids – whatever you feel like putting in the scene. Make sure that you blend it in, perhaps using some masks etc., I’ve put some grass on the sea floor. Choose the colour you used for the sea as your foreground colour and black for the background. 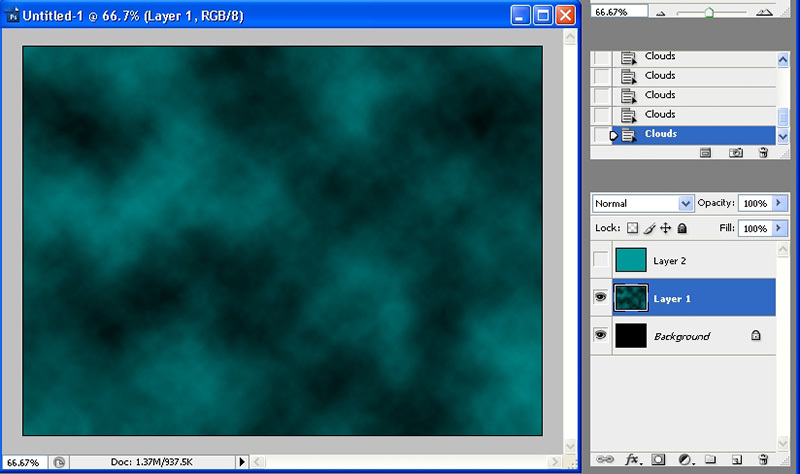 Select the brush tool and from the brush menu choose ‘grass’, which is a default photoshop brush. 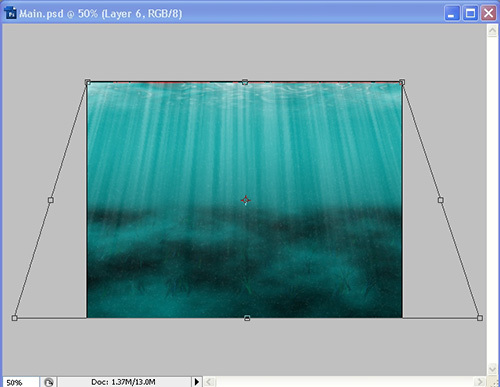 Use a seperate layer for each of the sections of the sea floor. I eyeballed the the sea floor into 3 sections and using a smaller brush on the back third scattered a few brush strokes, then reduced the opacity of the layer to 20%. I increased the size of the brush by tapping the right bracket key a couple of times, then did the same thing with the middle section and reduced the opacity of that layer to 25%. Finished off with the foreground by increasing the brush size by a couple of more taps on the right bracket key and reducing the opacity to 35%. I used a mask on this layer and faded the bottom edges of the brush strokes a little. Btw, I didn’t change any of the settings for the brush. You can also use the grass to help make an object blend more seamlessly into whatever scene you are creating. You might end up with something similar to the image below. Now we need to create some rays of light. 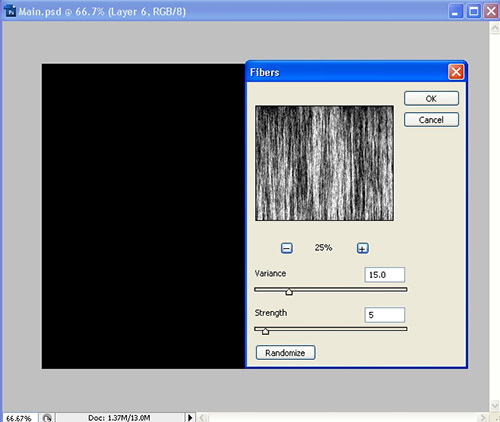 Create a new layer on top of the layer stack and fill it black. Make sure the f/ground is set to black and the b/ground to white (default) and go to Filter>Render>Fibres you can use the settings I have below. 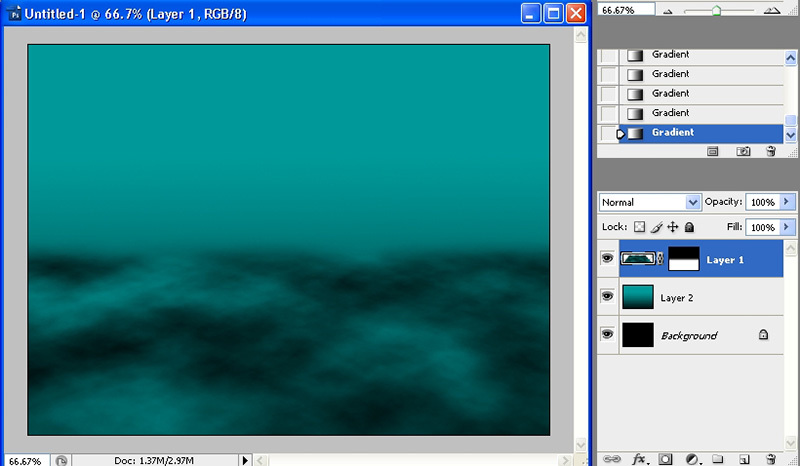 Next go to Filter>Blur>Motion Blur and for this image you can use the same settings I have below. Change the blend of the layer to Screen and take the opacity down to about 55% – you can go back and change this later. Add a layer mask to this layer and get a black to transparent gradient. Starting at the bottom of the image and holding down the shift key, take the gradient all the way up to the top of the image. 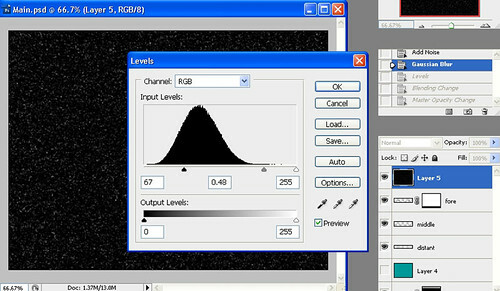 Make sure the gradient is set to linear. 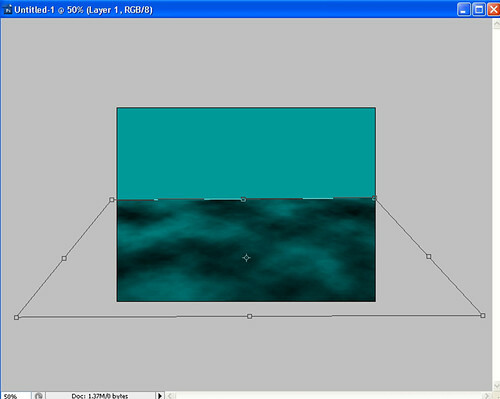 Bring up the Transform Tool by clicking Ctrl + T on the keyboard and right click inside to select Distort. You’re going to do the same thing as you did with the sea floor originally – see image below. I further reduced the opacity of the rays layer to 35%. And here is the final result. Added by Ally Johnston on March 11, 2012.